I've been recovering for 15 years now, after a lengthy career caring for critically ill patients. Now, I’m part of a team at SAS that’s working to transform health care – and that's important to me because of something that happened when I was an ICU nurse. It changed my life, and though I say I’m recovering, I may never fully recover from what happened that night. It was a busy Friday evening at the inner-city hospital ICU where I worked. The ICU had been at maximum capacity for weeks, with post-surgical and emergency department patients lined up, waiting for beds. I was working as a manager back then, so I was responsible for managing that busy ICU, and we were short staffed that night, so I also had patients to care for until the new shift arrived at midnight. The distractions were relentless: Physician demands, equipment alarms, new patient arrivals, families who wanted to talk to the supervisor, and the phone was ringing off the hook with other departments asking when beds would be available. I refocused on my patients, scrambling to make sure that everything was in order for shift hand off, so I could turn my attention to bed management. I began providing the shift report to one of the incoming nurses at my patient’s bedside. The patient, who’d been with us for days, had been extremely agitated for the last four hours, but was now surprisingly settled. He'd been a difficult patient -- he was suffering from delirium tremors (a condition caused by the sudden withdrawal of alcohol or drugs). I looked over and when I saw what had happened, it was like someone had punched me in the stomach. Could I really have infused a whole bag of opioids into this patient over the last hour? I'm in the business of helping people get better, not harming them. Proud of the fact that the care I delivered was meticulous. But I am human, and I was now part of a statistic -- a medication error statistic. Supported by a fantastic resident on call, a sedation protocol, and ventilator-assisted breathing, my patient suffered no adverse outcomes. In fact, several of my colleagues jokingly thanked me for finally getting him under control. It was no joke. It was a life-changing event. Not long after that incident, I left patient care to pursue a career in health care informatics. I joined a medical device company that used software embedded inside its devices to prevent nurses, just like me, from making a serious error. Thinking about what we do at SAS and reflecting back on that technology, I realize, it’s all about the analytics and delivering insights from the analytics into workflow to change behavior, to prevent error – to save lives. My excitement and interest in what technology can do to transform health care, to be part of that equation, and to make patient care safer, has never wavered. 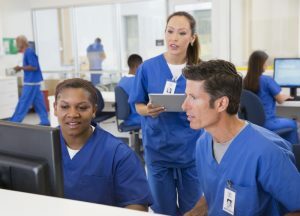 In this blog series, I’ll share how health care is responding to the 4th industrial revolution … using data and analytics to prevent error, enable better decision making and to create an optimal health care experience. As we know, health care analytics is about data-driven solutions to improve outcomes and patient experiences while controlling costs, and for this chat we will be exploring the patient no-show problem that healthcare providers face. What is the role of analytics in the patient experience? What are the major consequences of high patient no-show rates on operations, finances, physicians and other patients? How can technology help health care providers overcome no-show rates? What role does analytics play in addressing the no-show problem? What organizational barriers can get in the way of implementing solutions that address no-show rates? How can providers balance implementing a new solution with the need to not add to the workload and work flow of staff? What benefits are health care providers already seeing with the use of advanced analytics? Here’s everything you need to know about participating in the weekly #SASChat! Hope to see you online!